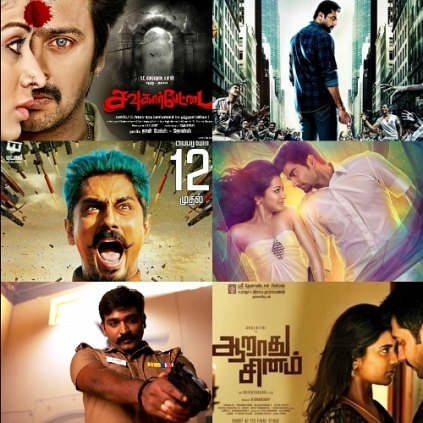 2016 has already witnessed 6 weekends, with over 15 Tamil films releasing, out of which few have performed really well at the box office, while few have garnered critical appreciation too. Our report on the Chennai city box-office has declared three films with the ‘HIT’ verdict - Rajini Murugan, Aranmanai 2 and Irudhi Suttru. This indeed looks like a great start to the year for our industry. The previous week spotted the much raved about rustic film Visaaranai which has had a good opening with terrific reviews from critics and audience alike. Following is the list of expected films that will hit the big screen in the following weeks for the month of February. We can expect addition/deletions to this list. We will keep you posted. Suriya for TN Assembly elections? Jayam Ravi Opens Up On Miruthan During A Surprise Twitter Chat Session Today. People looking for online information on February 2016 release, Jil Jung Juk, Miruthan will find this news story useful.